I have never done Best of year **** in my blog previously, so When Valli sent us a mail this time, i thought why not try this time, it was like reliving those foodie moments again. Thanks to Valli and my blogger friends for all the encouragement and my readers for the love. I got a new domain for my blog in the beginning of this year. Enveetu Kitchen received some attention in the online Food Magazine Food e Mag Dxb, a food magazine conceived and published by 2 creative people from Fooderati Arabia Group. 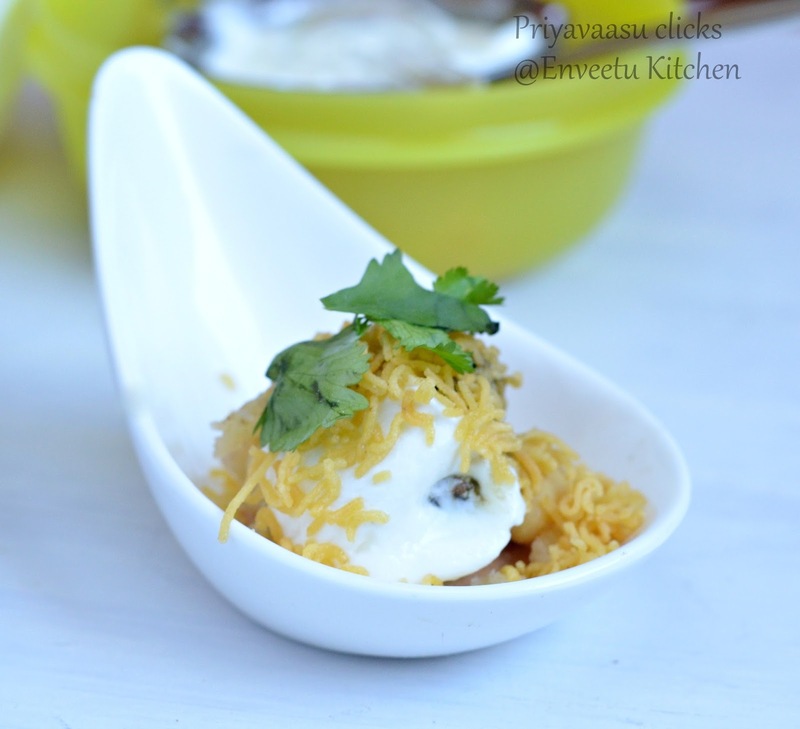 I m trying to spot the Best 12 Recipes from my blog for the year 2014, that i loved the most. I hope you like them too. 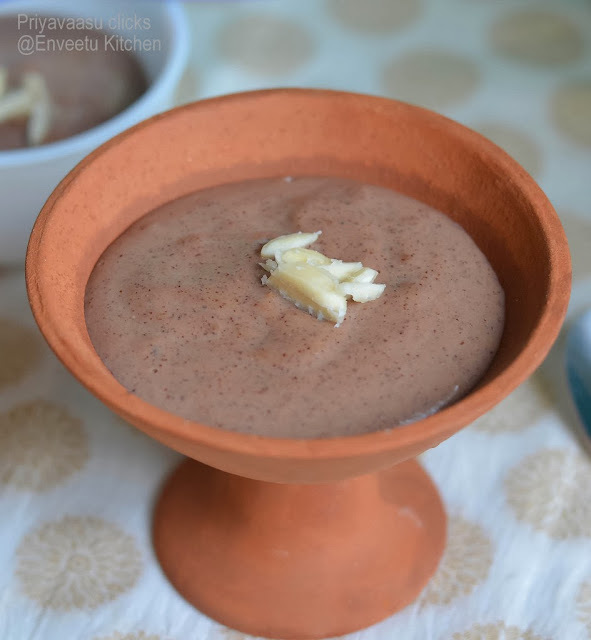 Ragi Chocolate Pudding, a smooth and chocolaty pudding using Millets, also a quick one to make.This was the first recipe got featured in the online magazine. 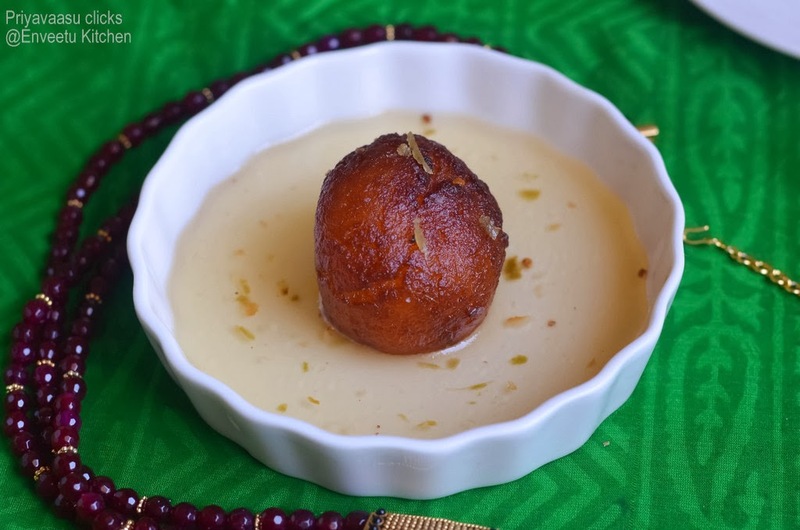 Gulkand Gulab Jamun, an exotic dessert which turned out to be an absolute favorite in our house. 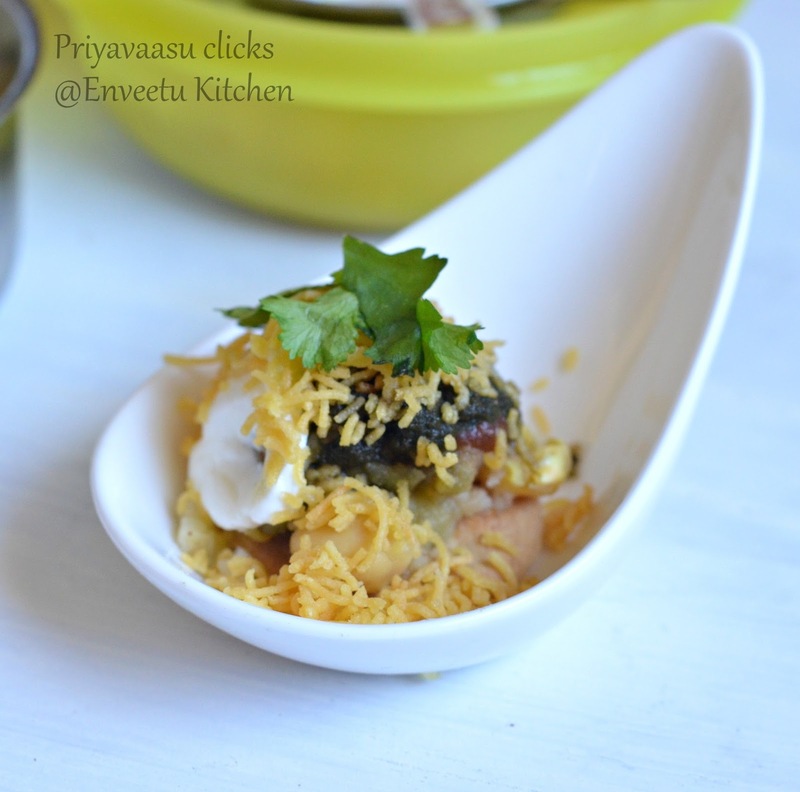 Soft, jamuns stuffed with rose petal jam/Gulkand, a must try!!! 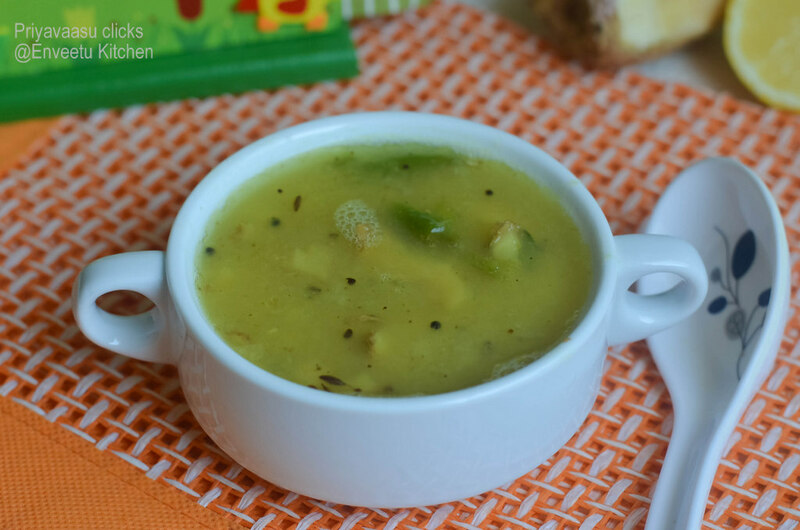 Ginger & Lemon Soup, another favorite recipe of mine and also for many others. Mild soup with ginger and taste of lemon, light on tummy, yet so much on taste. This is the second recipe that got featured in Food e Mag dxb! I participated in the first ever Mega Marathon, Indian Food Odyssey, a virtual culinary journey across the Indian States, It was super fun and lots of learning. My favorite was North-eastern cuisine. It was very tough finding a vegetarian recipe in NE cuisine, a little more probing lead to some research papers and documentation of their food habits, which revealed how Organic, natural and local their cuisine is. 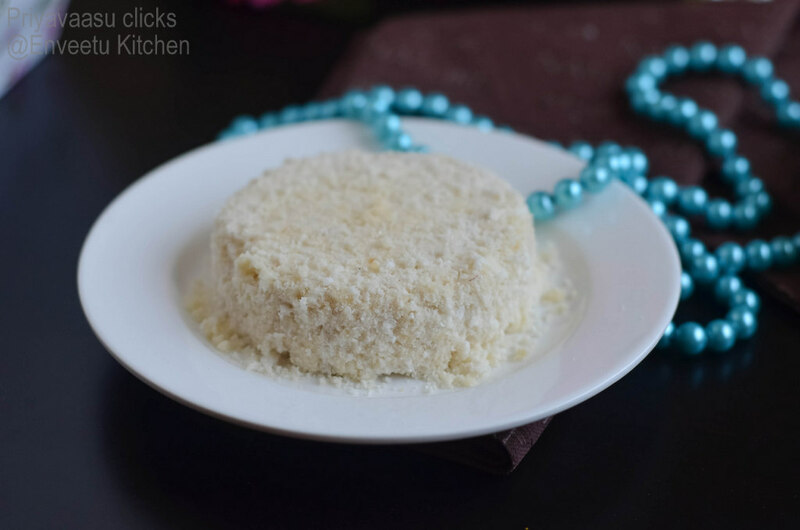 Though all the 30 dishes are my absolute favorites, this simple steamed rice flour Putharo,from Meghalaya, stands out special. 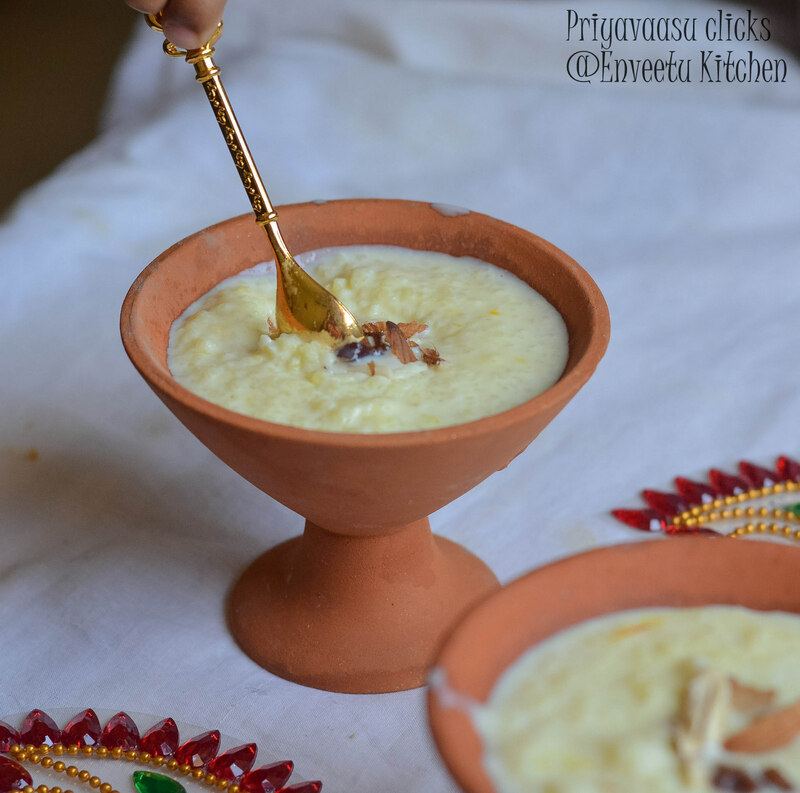 And also this Jhangore ki Kheer/Barnyard Millet Kheer from Uttarakhand got featured in BBC GoodFood India, a special moment for the foodie in me! 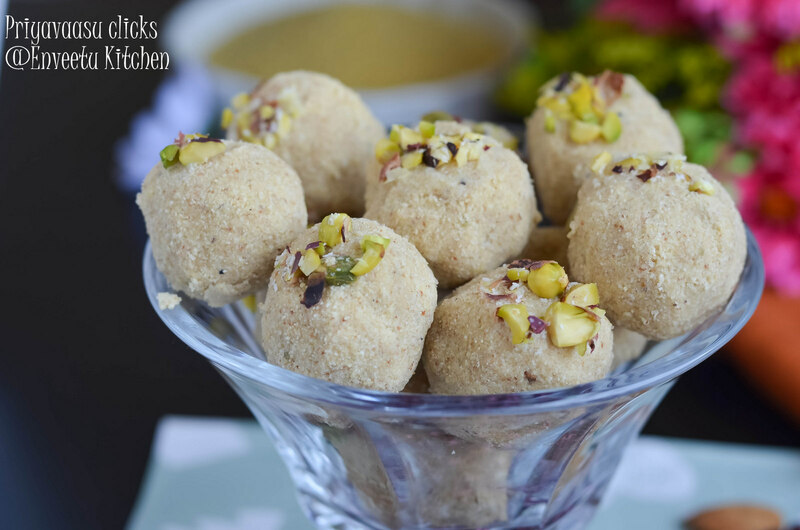 Thinnai/Foxtail Millet Laddu, a sugar-free, fat-free, a Vegan Dessert, got me much attention around the healthy circle, many of my blog readers, who are diabetic and also calorie conscious, tried these ladoos and gave thumbs up on the taste!! Another traditional snack, using Millets, Thinai Arisi/Foxtail millet Puttu/Steamed cake. Thinai/Foxtail Millet is traditionally used to make Sweet dishes, for its distinct taste. 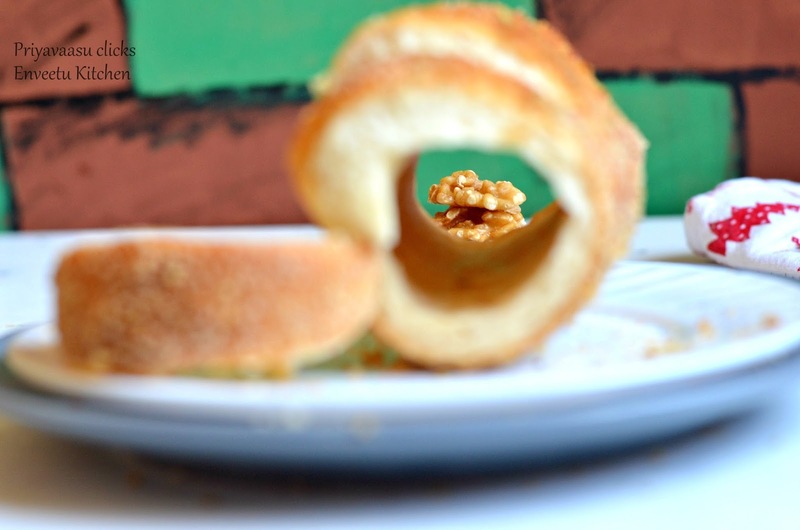 This puttu with loads of coconut and nuts, is for sure a filling snack! Thinai Godhumai Rava Laddu/Foxtail Millet and Wheat Rava Ladoo, made for Krisha janmashtami, especially for my parents, both are diabetics and they have tremendous control on their food habit, i made this for them to enjoy guilt-free. September, i did my second marathon with International Dishes, Around the World in 30 days. This Gozinaki, a nut candy from Georgia is my favorite amongst the dishes. Not only mine, for most of my friends too. 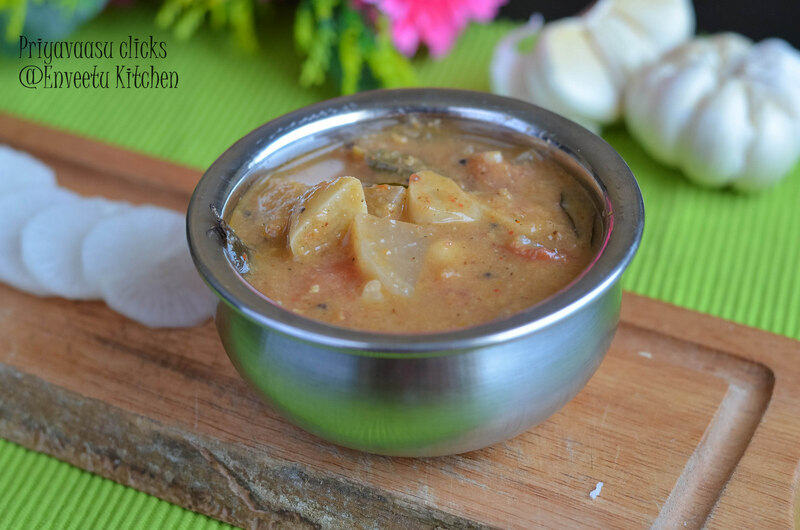 After all the Diwali Food, we just loved this simple Tomato-Garlic Rasam. One of our favorite Comfort food, Mixed Vegetable Moongdal Khicdi, a complete One-Pot Meal. It was a fantastic year on the food side. I ventured out of my comfort zone and tried lots of breads from across the world. Fell absolutely in love with bread baking and have loads of bookmarks to make. Hopefully will do them one by one this coming year. Wishing you all a Fantastic New Year 2015!!! 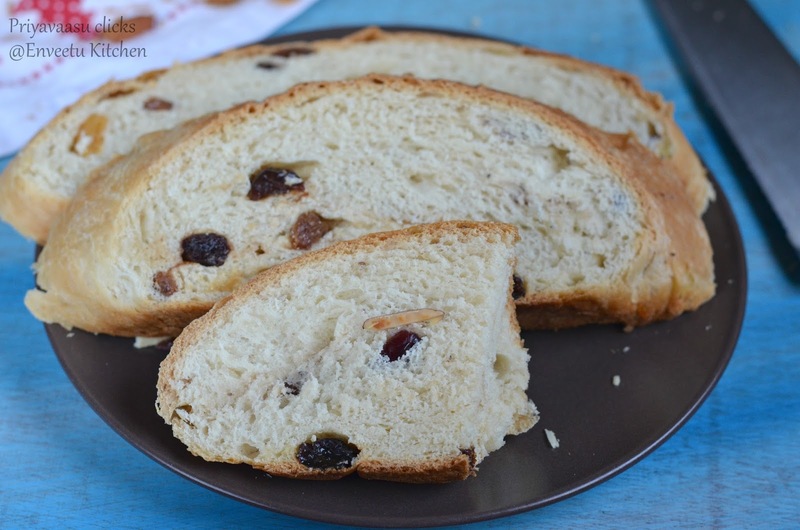 Julekage is a rich, flavorful bread which is traditionally served at Christmas in many Scandinavian countries, particularly popular in Norway and Denmark. 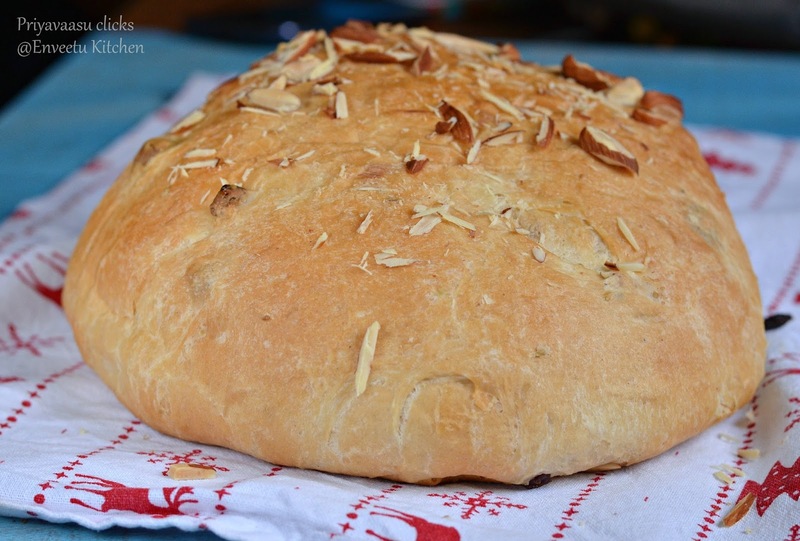 The bread may also be known as Julekaka or Julekake, which means “Yule Bread” in Norwegian. 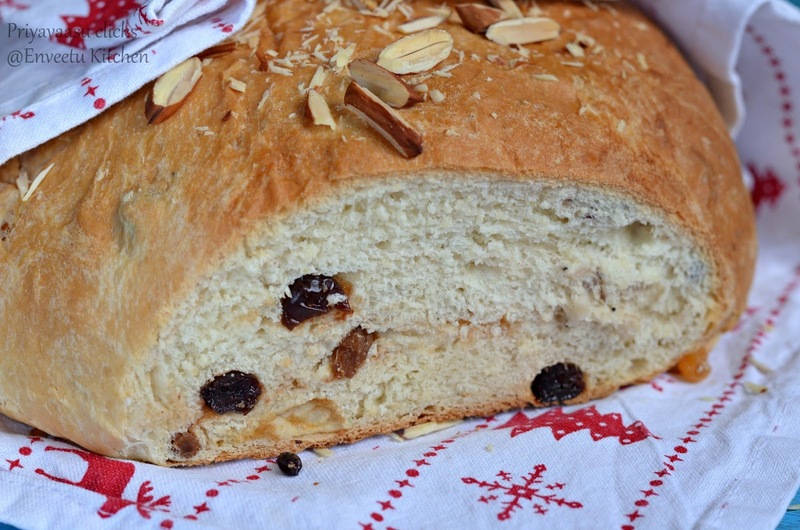 Like many holiday breads, Julekage involves candied fruit and nuts, and it is heavily spiced. The traditional spice used in Julekage is cardamom, although nutmeg, cinnamon, and other flavors may be used as well. The bread tastes best when served warm straight out of the Oven, it can also be served next day with a generous spread of butter!! 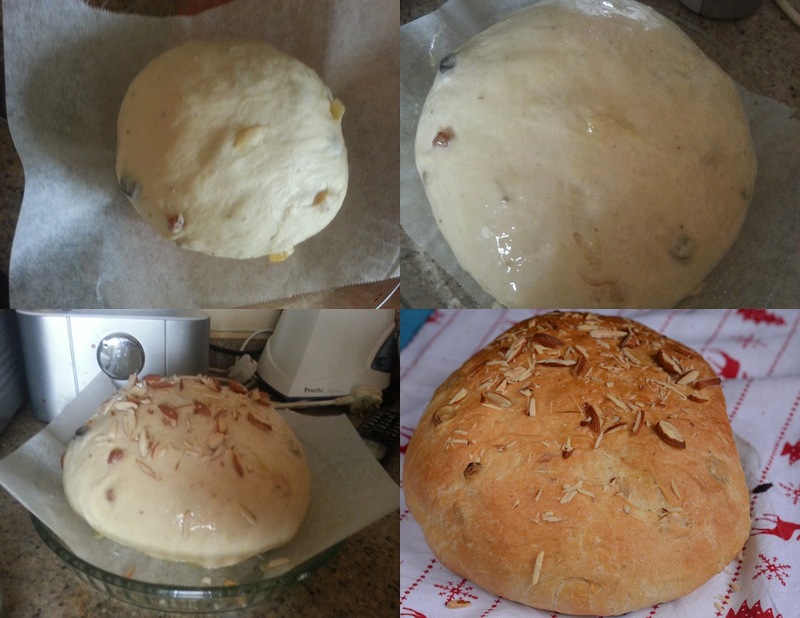 As I have already baked a cardamom flavored bread, I knew the taste, so I readily baked it and with all dried fruits added it was really rich bread apt for the festive season. I didn't have any candied fruit in hand, so I have used some.dries cherries and berries along with raisins. 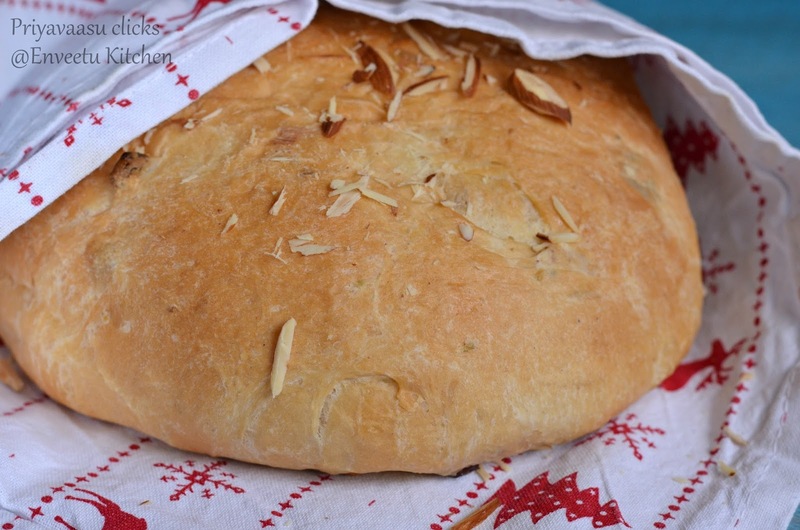 The bread can be topped with sugar glaze, I avoided it for the obvious reason, instead topped it with chopped almonds, it gave a nice crunch to the crust. 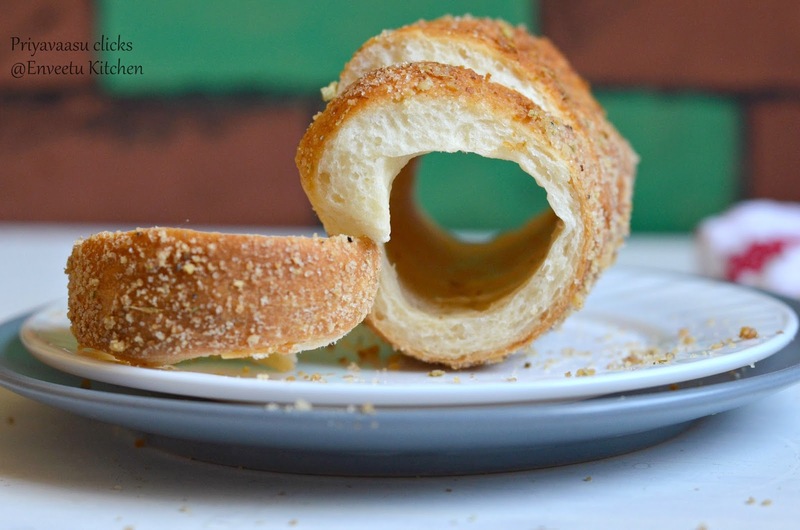 Take bread flour, instant yeast, sugar together in a bowl. Mix well to combine. Warm milk in microwave for 20 seconds add butter to the milk. Now slowly add this milk mixture to the flour mix. Using a spatula start mixing the flour. Once both the flour and milk is incorporated well. Take the flour on to a kneading surface and knead well to form a smooth elastic dough. Now to add the dried fruits to the dough. 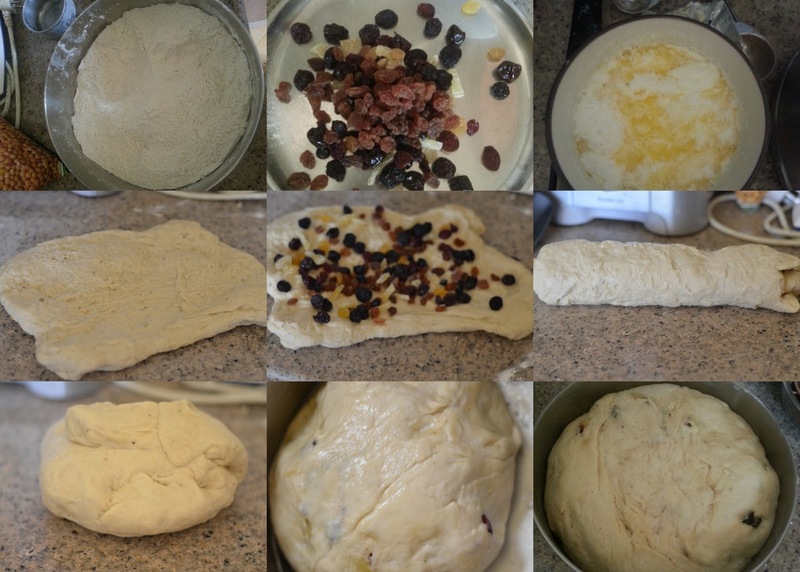 Stretch the dough roughly into a rectangle, spread the dried fruits on it and now roll the dough into a jelly roll and knead it to form a dough. Let the dough rest in a well oiled bowl for an hour or until it doubles. Take the dough on to a flat surface, punch down the extra air and knead the dough for a minute again and shape it into a boule/ball. Grease a flat baking tray and lay it with parchment. Lay the prepared boule/ball on a prepared baking tray. Let the dough rest another 45 minutes. Preheat the oven to 180C. Brush the bread with milk-oil mix and bake it for 30 minutes or until the top turns golden brown. Let the bread sit in the oven for 2 minutes, take it out of the oven and let it cool in the tray for 5 minutes, then transfer it to a wire rack.and let it cool completely. Slice and enjoy warm along with tea. Today i was supposed to post a Broccoli and cheese tikki, a baked version of-course. But it ended up like something different, though it tasted finger-licking yum, i couldn't put it as chat!! !My mind started thinking fast, as it is getting dark, if at all i m making something, i have to get it done in another 30 minutes. I had some leftover papdi dough in the refrigerator, i immediately made these katori's and filled with toppings i had in hand. The chat came out good. My better half felt that it needed little more spice, so i have adjusted the recipe accordingly by adding little chili powder. But, at the end i feel Chat taste and preference varies from person to person. So, adjust the seasonings accordingly. 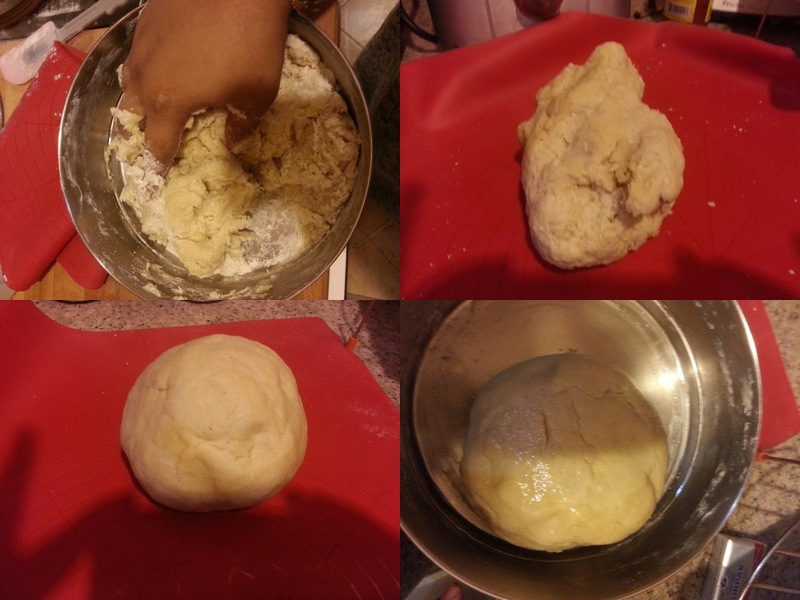 Divide the dough into 2 portions. Grease your tart pan and keep it ready. Roll out each portion into 20cm(diameter) circle. Prick the dough all over and use a cookie cutter or bottle lid to cut out the dough to fit the tart mould. I used 200gms Nutella bottle lid to cut out the dough. Preheat the Oven to 220C. 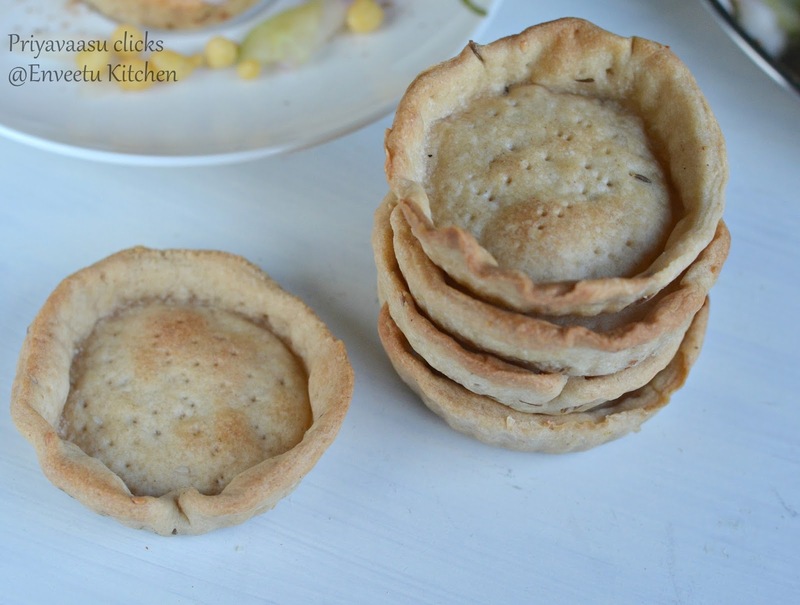 Lay the cut rounds of dough on a greased tart mould. Press the dough well to the tart base so it takes the mould shape. Bake the katori for 11 minutes. Take it off the oven and let it cool completely on a wire rack. Store the Katori's in an air-tight container until use. Mix together chana, cucumber and onion, 2 pinches of chat masala, 2 pinches of red chili powder and lemon juice. Mix well. 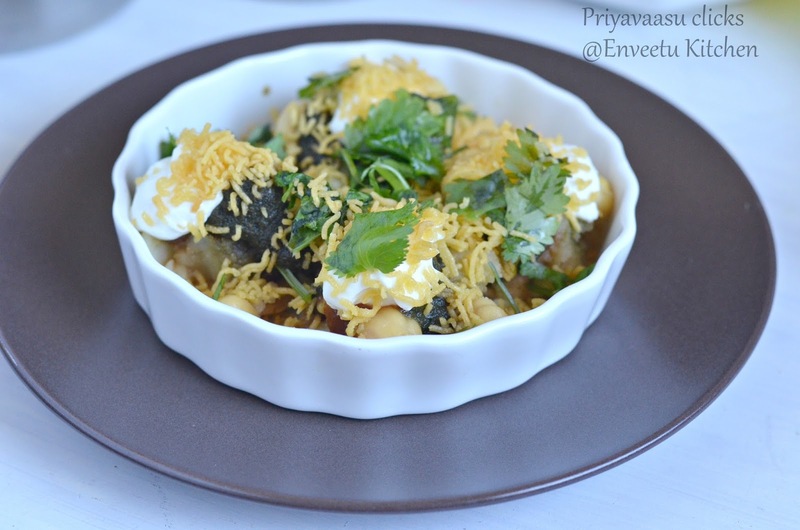 Place the baked katori on a plate, fill with 2-3 tbsp of chana-onion and cucumber mix. 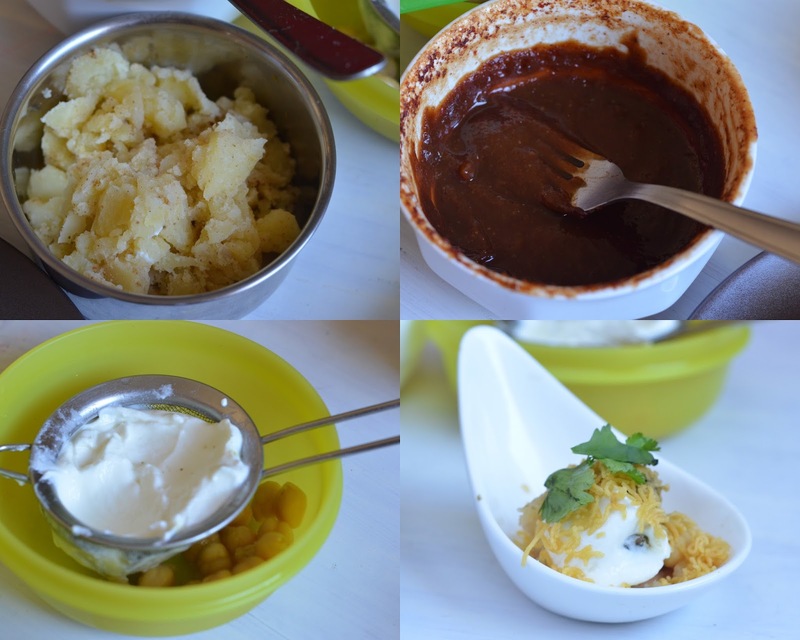 Add sweet chutney, hung curd and top it with boondi. 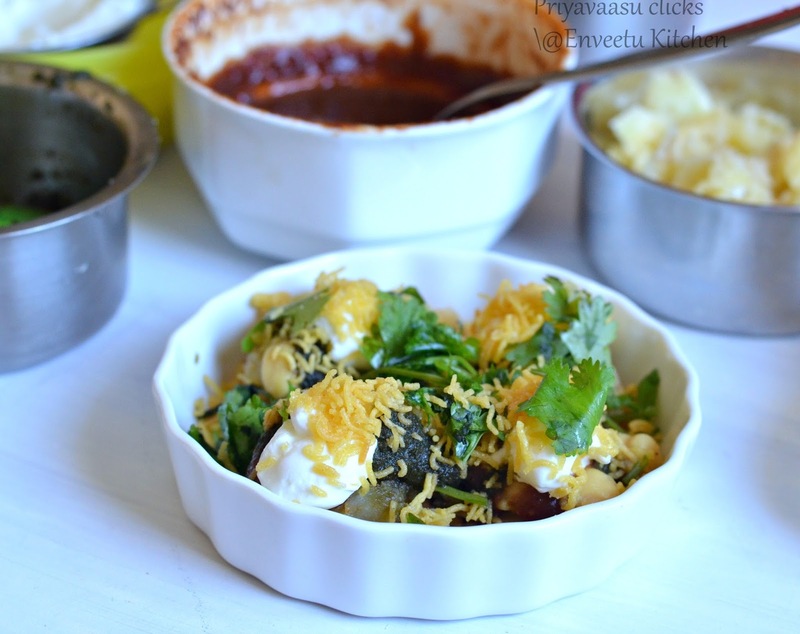 Sprinkle a generous pinch of chaat masala. Enjoy!! The Last week of Blogging Marathon #47 starts today. I have chosen the theme : North Indian Party Starters. Since i m doing the Bake-a-thon along with this BM, i chose to make Baked Party Starters to please the crowd. These Samosa Pinwheels were the first i chose for this week BM. A perfect party pleaser i would say. Kuttu, My EO who normally avoids savory bakes, was happily gorging on these pinwheels and gave me a thumbs up when he took a bite. An advantage with this bake is, you can freeze them and bake whenever necessary. I actually made half of them yesterday and froze the other half. Today Morning i baked the frozen half. They go very well with Tomato ketchup, i made some mint chutney to compliment them. First prepare the filling, while it is cooking, make the dough. So, while the filling is cooking, the dough can rest. Wash, peel and cook potato until soft, mash and keep aside. Keep the carrot grated and onions chopped. Heat oil in a pan, add cumin seeds, add onions and saute until translucent, next add grated carrot and saute for 2 minutes. Next add the mashed potaotes and dry masala powder to the curry. Adjust salt. Take care while adding salt, coz the dough also has salt. Let this cook until the rawness of the masala's fade. Take it off the stove and Let it cool. While it is resting, prepare the dough for the pinwheels. Take both the flour together, add salt and sesame seeds, mix well. Add oil to the flour, and rub well into the flour. Now slowly add warm water to this flour and start kneading a soft dough. Let the dough rest for 10 minutes. 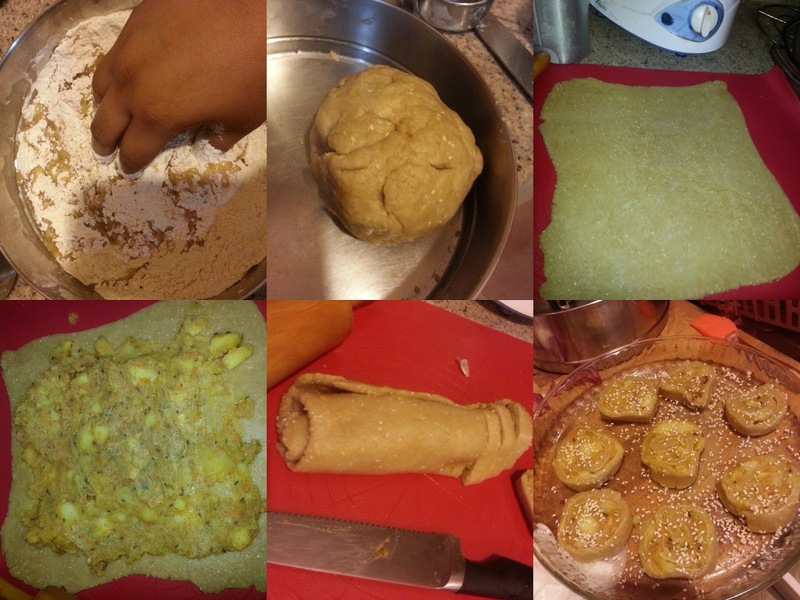 When the filling is coll enough, start rolling the dough out. 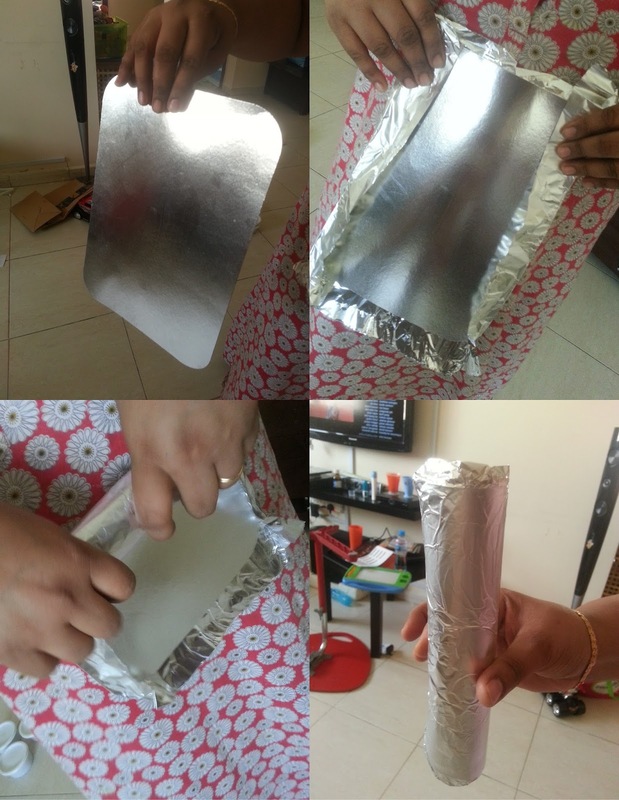 Roll the dough out to a rectangle that measures 12 X 12 inches. Spread the filling on the rolled dough leaving about an inch gap around the corners. Grease a baking tray with oil and keep it ready by the side. Roll the dough tighty like a jelly roll. Using a bread knife, cut the dough into 1/2 inch roundels. I got about 18 roundels. Place the cut roundels on the baking tray. Brush with milk and oil mix. sprinkle sesame seeds on top. Preheat the oven to 180C. Bake the pinwheels for about 40 minutes or until the sides turn brown. Take it off the oven and let it cool on the wire rack. Serve warm with tomato ketchup and some mint chutney. 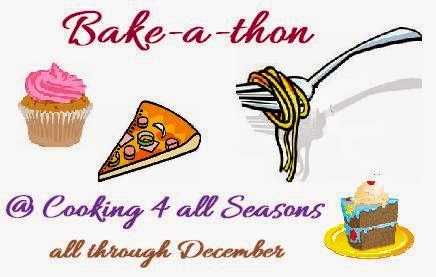 Sending this to BakeFest#38, happening @ Taste Junction, an event by +Cooks Joy . 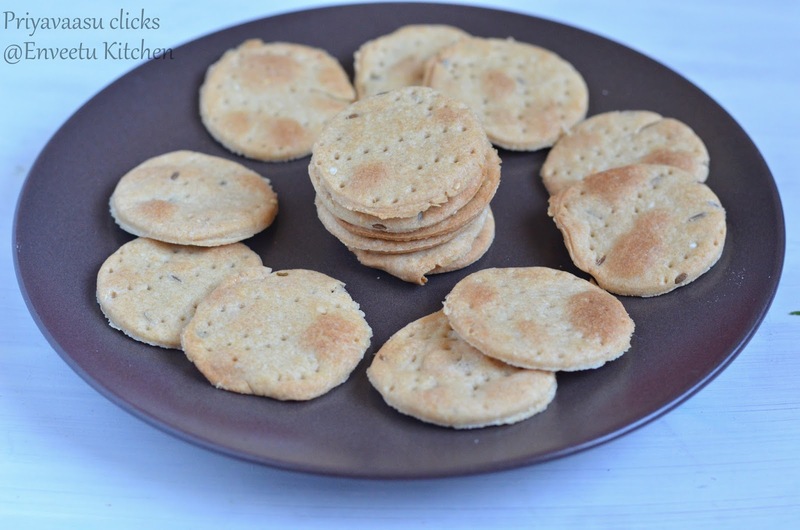 Let's Cook Savory snacks for Christmas, happening @ Simply.Food, Kids Delight - Holiday Special for Christmas and Newyear, happening @ +Sandhya Ramakrishnan's space, event by +Srivalli Jetti and also to What's with my cuppa, happening @ The Veggie Indian. Pulla, a traditional cardamom bread from Finland. 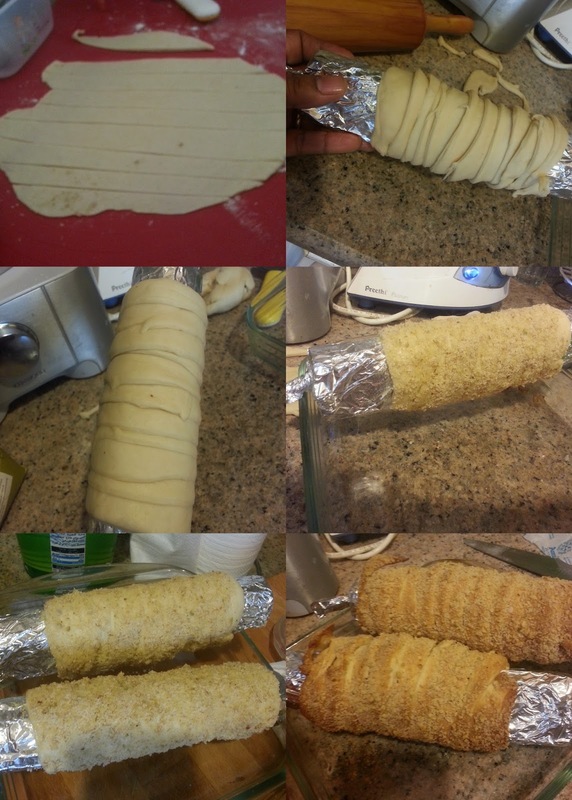 Braid loaves (pitko) are formed from three or more braided strands of dough, which are coated with melted butter and sugar, though optional. Pitko is typically served in thin slices with coffee or at special occasions. Regular small pulla is served as a whole. Serving pulla with coffee is a very common practice in Finland. I bookmarked these braided beauties for September BM itself. But, unfortunately, i couldn't get a fluffy bread then. So, i made Rye bread from finland. 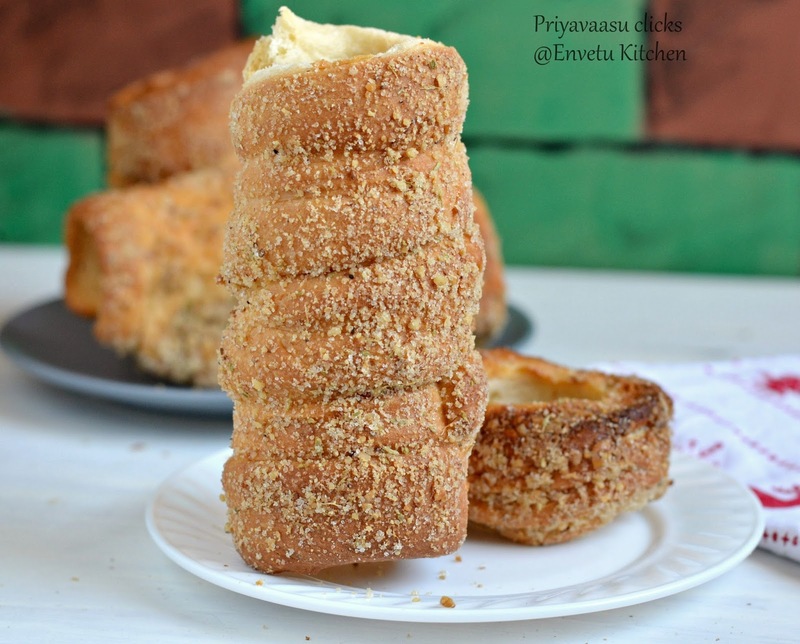 The Pulla can also be rolled flat into a rectangle filled with cinnamon sugar and cut into slices and baked, which are called Korvapuusti, Nordic Cinnamon Rolls. Take flour, yeast, cardamom powder, sugar in a large bowl. Mix well using a spatula, to get a uniform mix. 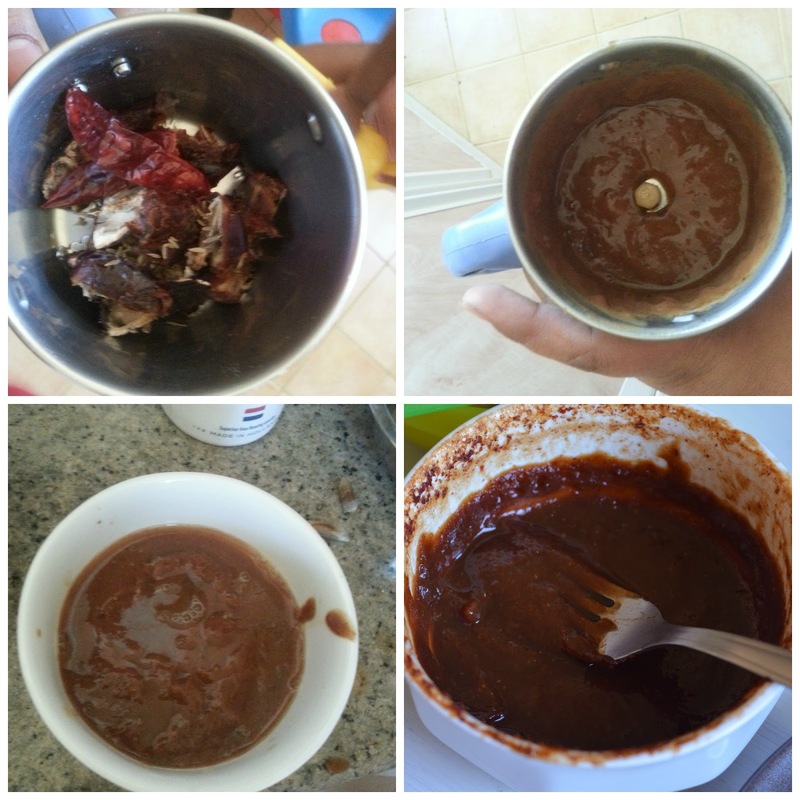 Take milk and butter together and microwave for 20 seconds, alternatively warm it up on stove-top.The Milk should be warm to touch, not scalding hot. Take care with liquid temperature while working with yeast bread. Coz too hot or too cold liquid will kill the yeast. Now slowly, add the warm milk-butter liquid to the flour mix slowly and start mixing with the spatula. When all the liquid has been incorporated into the flour, it will look very clumpy. Start using your hand for kneading the dough. The dough is pretty soft and easy to handle. Once you have got all of the dough into a rough ball, take the ball on to the kneading surface and knead for around 4 -5 minutes to get a smooth and soft dough. Let the dough rest in a well-oiled bowl for an hour or until it is doubled in its size. Once doubled, punch down the dough, divide the dough into two equal halves. Divide each half into 3 pieces. Roll each piece into a rope of 16 inches long. Keep the edges of the 3 ropes together and braid them together. Repeat the same with the other half of the dough. Rest both the braids on a prepared baking tray lined with parchment. Let it sit for an hour or until it doubles in volume. Preheat the Oven to 220C for 15 minutes. Once the braided pulla doubles in volume, brush it generously with butter and milk. Bake @ 220 C for 15 minutes and reduce the temperature to 180C and bake for another 20 minutes. Take it off the oven, when the top has a golden brown. Brush the top again with some melted butter. Let it cool completely on a wire rack. Slice and serve with a warm cup of tea. They are damn delicious straight out of the oven when they are still warm. Leftover bread stays good on the counter for a day, can be wrapped in foil/cling film and refrigerated for 2 days. 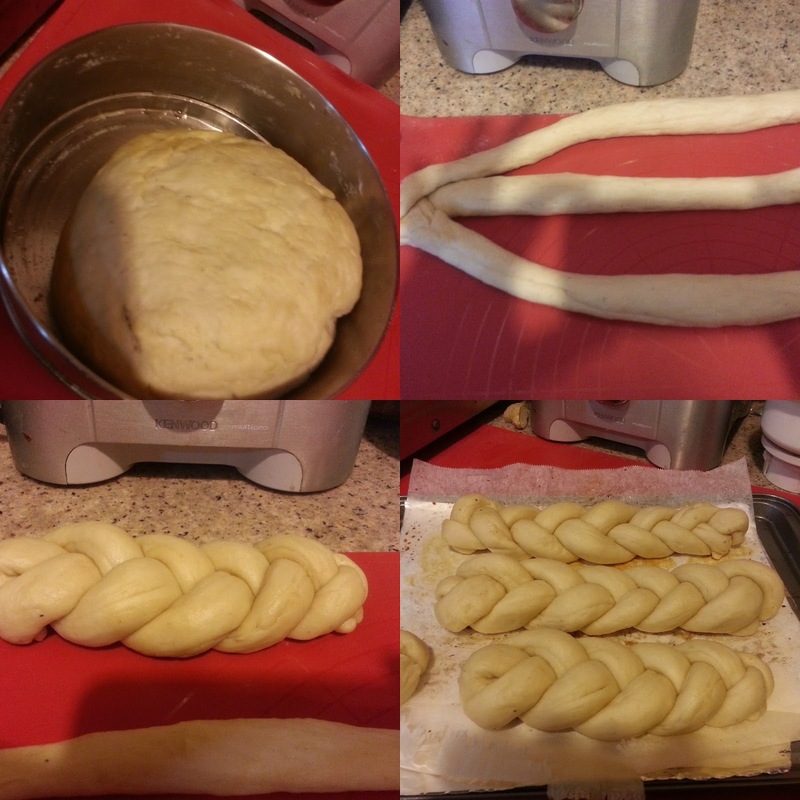 I made 4 braids, first braid got over the same moment, it was out of the oven. Shared one with my neighbor and have packed 2 in the fridge, which i will sharing with my BIL's family. 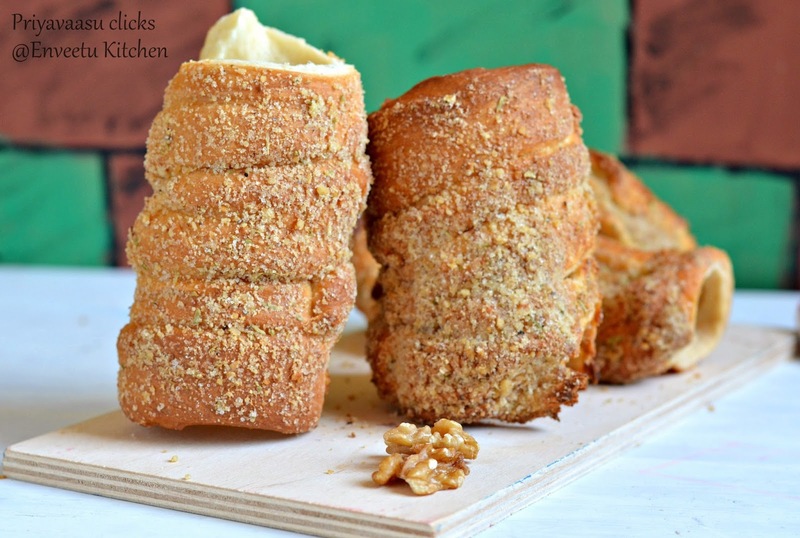 These loaves make a great edible gift during the festive season.